It seems that no matter what day or what season, whether I'm feeling uppity or crooked, there's that inert energy in me that's pushing me to make something in the kitchen - doesn't matter if its a regular dinner meal, or something to bake in the oven. Yeah. Good and bad, in a way. I've been feeling really weak since my physio appointment yesterday. My muscles ache all over, bones feel so weak nd my body is moving in slow motion. I skipped work today to take a bit of rest and take the time to review for my practical exam in Kitchen 10 next week. As it is the last week of the school holidays, the girls are at home. And by that it means, patience and tolerance. Cranky might be in the picture, yes. But as long as they have a full stomach, they'll be fine. So with the cupboard filled with other 'sometimes-food', I moved in slow motion and made these. Devil's food cupcakes adapted from the Martha Stewart website. Either I'm feeling devilish or you'd have to believe me when I say the choice was perfectly random. It's all good. The girls enjoyed it with the ganache (did you know you can keep ganache in the fridge for about a month) left over from our No-Bake Strawberry Ice Box Cake, with a bit of 100s and 1000s sprinkled on top. I topped mine with some dark chocolate shavings. 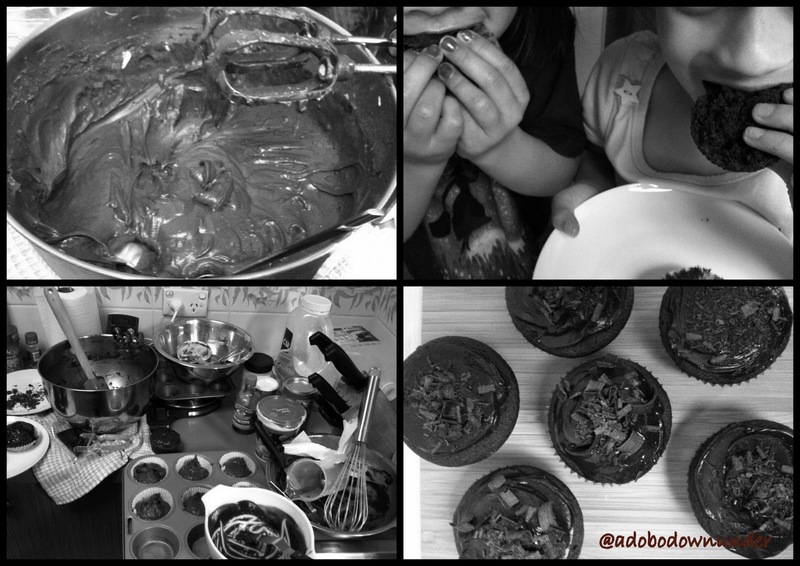 Nothing beats chocolate cupcakes to keep you up to speed with the day's routine! Yeah. Revving up right now. Pre-heat oven to 175* C. Line the muffin tins with paper liners. (we used a standard 1/2-cup cupcake/muffin pan). Whisk the flour, bi carbonate of soda, baking powder and salt in a separate bowl. Melt the butter and sugar in a sauce pan over low heat. Stir to combine. Remove from heat and pour into a large mixing bowl or the bowl of your stand-mixer. On medium-low speed, beat until the mixture has cooled approximately 5 minutes. (The mixture will look a sharp yellow, thick and grainy). Add the eggs one at a time, continuing to beat the mixture for about 30-45 seconds, after every addition. Scrape down the sides of the bowl when necessary. Add the vanilla extract and stir. Then add the cocoa and beat to combine. Reduce the speed to low, add the flour in 2 batches, alternating with the sour cream, beating until just combined. Transfer the tins onto a wire rack and cool for 15 minutes. Turn cupcakes onto the rack to cool completely. Frost the cupcakes with Martha Stewart's chocolate ganache and Martha Stewart's chocolate shavings (or you can use your own). These cupcakes are moist and soft and oh so devilishly brilliant. They are not too sweet by itself too. We've tried a different Martha Stewart recipe before - the one bowl wonder but this one is definitely worth coming back to every time. Certainly agree with Julia Child on the drama. Cupcakes need to go with a bang as well. Don't you think this cupcake's such the drama queen? Have a great weekend everyone! And enjoy life's little dramas ~ !